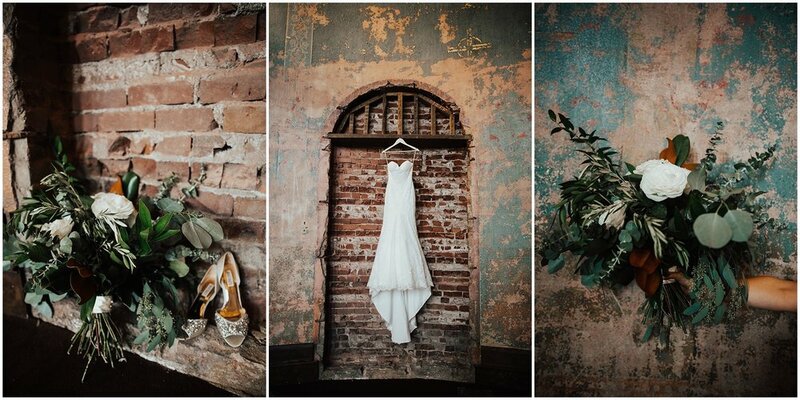 From the bride: I have always found beauty in architecture. I wanted our wedding day to be surrounded by some of the prettiest buildings and structures in the Northern Kentucky/Cincinnati area. You will see that throughout our wedding photos. We decided to get married in The Cathedral Basilica of the Assumption in Covington, KY, inspired by Notre Dame Cathedral in Paris. You can only imagine the organs inside the Cathedral and how they make the church all the more special. On our wedding day you would have heard Trumpet Voluntary, Canon in D, Air on G String, and more. I walked down the aisle to Bridal Chorus and left hand in hand with my husband to Wedding March. How can you not feel like a princess in a moment like that? We held our wedding reception at The Monastery Event Center at the highest point of Mt. Adams where you can see all of downtown Cincinnati. Just down the street from Mt. Adams is a beautiful viaduct separating Eden Park from Walnut Hills. We climbed up a hill to be underneath the viaduct for all our family and bridal party portraits. The arches underneath are stunning for a space most people don't get to see. Some of the special moments on our wedding day included when Blake and I saw each other at our first look. Prior to getting married we completed a marriage preparation course. During the course we had to write each other a letter and read them to one another for homework. When it came time to read them to one another, we were amazed because we both started our letters with the exact same first sentence. For our first look I wanted the moment to be special and more than just seeing each other for the first time that day. We decided to write each other another letter to read during that moment. Once we saw each other, Blake began to read his letter first. I was so overwhelmed laughing and crying because, unknowingly, this time we not only wrote the exact same first sentence but we also wrote the exact same second sentence. It really spoke to how close and in sync with one another we were as we were about to marry each other. Another special moment included some gifts on our wedding day. My mother gave me a handkerchief that was my Papa's before he passed. She sewed lace around the edges and stitched his name and date of birth and death in it. I also gave handkerchief's to my bridal party saying "No Ugly Crying" as well as handkerchiefs to my mother and father with a small message to each of them. Another special feature of our wedding day was having my bridesmaids wear white with me. With the bridesmaids in all white and the groomsmen in a dark navy it set the tone for a romantic and timeless wedding. Additionally another non-traditional feature in my wedding was our bouquets and boutonnieres. I did not want the flowers to look structured and intentionally placed. I instructed our florist what flowers I would like to use and asked for her to scoop them together, just like she picked a handful of them out of a garden. I left the stems showing in all bouquets and boutonnieres to keep that fresh out of a garden feeling. My flowers were one of my favorite things from my wedding day. We ended our night with a sparkler exit. My husband dipped me at the end just like he did when we kissed “I Do.” It was the best day!